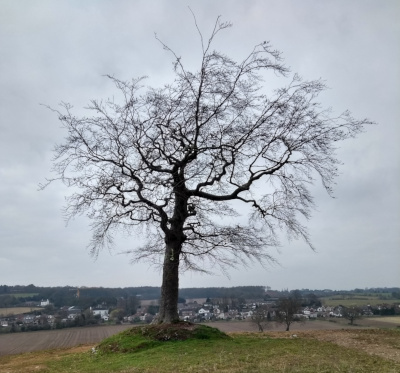 For decades, the solitary tree at Grove Hill, Stonnall, has been the cause of endless fascination and speculation among residents, visitors and passers-by alike, to the point in which it has long since acquired iconic status. But what, exactly, is known about it? The purpose of this paper is to gather any discernible facts, documents, research, circumstantial evidence and folklore associated with the tree which, in turn, might help us to tease out a few clues that point to its history and significance. Grove Hill and the Stonnall tree. The word grove comes from the Old English word graf, meaning copse or small wooded area. 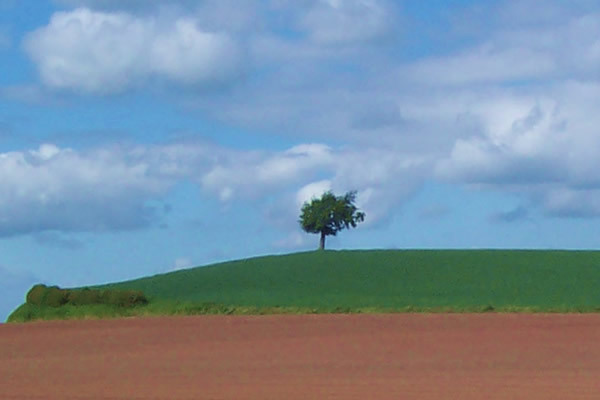 Cartographical evidence proves that the hill top once accommodated a group of trees (see fig 1 below). The tree is a beech, probably an example of Fagus sylvatica, a native British species. It shows signs of damage, which was probably inflicted early in its life. The single tree at the present location has been displayed on Ordnance Survey maps since 1883, which shows that it is well over 130 years of age at the time of writing (2019). It is now possible to state with certainty that it is not the last representative of the grove at the hill top, of which more below. The tree is stranded in the sense that it obviously never was part of a hedgerow. There is virtually zero possibility that the tree is self-set because it is located in a field that was ploughed up annually. Even if the field were to be left fallow for a year or two occasionally, a tree seedling would have no chance of becoming established because of inevitable and unavoidable disturbance to the soil caused by ploughing. It was once surrounded by a grassy knoll, of which more below. This feature was ploughed away in the 1980s. The grassy knoll, at some stage, had a horseshoe shaped, 2 - 3 foot-deep trench cut into it around the tree. It disappeared when the turfed area was ploughed away. 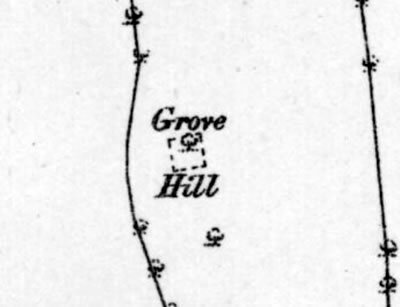 The earliest known map references to Grove Hill by name are contained within three documents, all dating from the early 19th century. This, at least, is strongly indicative that the name had become well-established by the time these items were produced. The name of the enclosing field is recorded in the Estate Map (1818) (see fig 1) and in the Tithe Map Book of Awards (1838) as Grove Hill , although no tree or set of trees is marked on either of these maps at this location. That does not mean to say, of course, that there was no tree or trees there at the time of the surveys. The surveyors might have considered that the feature was too trivial to bother with. The very first Ordnance Survey map of the area, which was issued in about 1850, displays a group of five trees where there is now only one (see fig 2). Whether the present tree was or was not one of them is discussed fully below. 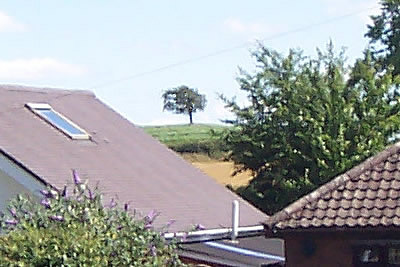 The group of trees undoubtedly gave rise to the name Grove Hill. The area is marked up as Grove Hill on this map. Fig 1. The hill in 1818. 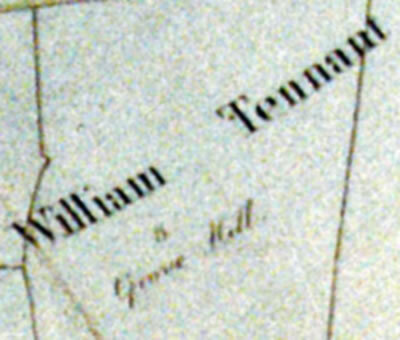 The mark between "William Tennant" and "Grove Hill" is the number 5. Fig 2. Centre: the hill in the early to mid 19th century with the grove that was comprised of five trees at the time of the survey. Fig 3. The hill in 1883. Obviously, the tree was well-established by that year. The broken line around it indicates the grassy area that once surrounded it. Clearly, there was another stranded tree in the field at the time. This was, in fact, the last remnant of the original grove. Shortly after the end of the last Ice Age about 10,000 years ago, this part of the West Midlands was covered in woodlands that stretched from Cannock Chase to Sutton Coldfield. After the introduction of agriculture during the Bronze Age, more and more space for growing cereals, other crops and pasture was required. A piecemeal process of deforestation took hold and, over hundreds of years, great swathes of woodland were cleared, with the vacated areas turned over to farming. Thus, the grove of Grove Hill was a remnant of the woodland that once covered the Stonnall area. Why was the grove retained when the rest of the woodland was cleared? In fact, during the period of deforestation already mentioned, it was not at all uncommon to leave a group of trees on a hilltop - especially when the area was thought to be an ancient tumulus or burial ground. This might seem to offer an explanation for the mystery of Grove Hill, but as we will see as this story unfolds, things will get a bit more complicated than that. Furthermore, as we will see below, the grove was used for social meetings and it is quite possible that this usage extended all the way from the remote past when it might have been used originally for ritual purposes. We should bear in mind at this stage that Grove Hill is on the edge of Druids Heath. Make of that what you will. What did the grove look like? There being no known photographic evidence from the period, we rely on the very precise OS Map survey of the early to mid 19th century to form an impression of the relative position of the trees (see fig 2). This would enable us to reconstruct the appearance of the hill top graphically, except that there is no information as to which species were present. Only guesswork is possible. Oak, ash, horse chestnut, sycamore are all common around Stonnall and, until the 1970s, elm was very common too. In the Tithe Map survey of the early 19th century, the field is described as 'arable', which seems to indicate that it was never used as a meadow for the purpose of grazing. It seems unlikely that a farmer would plough between the trees and so it is likely that the trees occupied a possibly grassy island on top of the hill that was surrounded by ground prepared for growing crops. Bearing in mind that a large tent seems to have been raised on this grassy area in 1823 and in 1839 and probably on many other occasions over many decades (see below for an explanation), there must have been plenty of room for it between the trees and the ground must have been suitable for pitching it. Anyway, the mental picure that we should take from this is that of a grassy island with trees on top of the hill that was part of a field used for growing crops. What happened to the grove? Whether the trees succumbed to disease or old age, it is certain that they died back one by one and that their remains were removed as necessary. As this process took place, the greater the area for ploughing became available, with the grassy area referred to above becoming progressively smaller over time. This process took place probably over several decades and, indeed, we can detect a transitional phase from one of the OS maps: in the 1883 edition, it appears that there was still one representative of the original grove still in place a few yards away from the present beech tree (see fig 3). Was the single tree of the present-day part of the original grove? In accordance with the present state of research, we can now state emphatically that the single tree on Grove Hill was not present in the original grove. A full explanation is offered below. A photo of the location of Thornes Hall with the tree and grassy knoll clearly visible. About 50 years after the disappearance of the last remnant of the grove, a Grove Hill landowner and farmer reportedly intended to "plough up" the Grove Hill feature. Whether the target of this plan was merely the grassy knoll or, indeed, the whole thing including the tree is unclear, but unsurprisingly, this caused considerable local consternation, controversy and news coverage. Landowner-farmer, Mr Sam Ikin, made clear publicly his intentions, apparently shortly after he had purchased the Manor Farm estate, which included the Grove Hill field, in 1945. By the way, it has been suggested by Val Powell that he was dissuaded from this course of action by Harry Jones of Primrose Cottage in Footherley Lane, Footherley. This abandoned plan is really only worthy of mention because of what happened afterwards. Following Mr Ikin's decision not to proceed, a response in the form of a letter was published in the Walsall Observer. It was written by Mr J W Poxon of 104, Lichfield Road, Walsall Wood and was collected by Stonnall history activist, Eric Fisher, in the 1970s. "I was very interested in the article in last week's Observer on the mystery of Grove Hill, Stonnall and I am pleased that Mr Ikin has decided not to plough it up. Without doubt it has a history. "For hundreds of years, legends about it have always captivated the schoolboy's mind and many like myself have conjured up pictures of what happened there and of the kind of people# who inhabited the surrounding country. "It was often stated that a battle was fought here and the dead [were] buried on the hill. Some said the battle was between the Romans and the Britons; others said between the Saxon and Dane. It was not impossible for both to have happened, seeing the road nearby joins the Watling Street at Brownhills West. "At one period in our history, the Watling Street was the dividing line, the Danes living on the north side and the Saxons living on the southern side. It could easily have happened that a scouting party of Danes could have run into a party of Saxons and a skirmish took place. I have not read of a major engagement here such as at Wednesfield or Tettenhall, but whether these things happened or not it has been recorded that the hill is the tumulus of an old Celtic chief of which there are many in the district. "It was opened in 1824 and contained a sword, dagger, battle-axes, lance butts and sword pommels, so this proves at least it is of historical importance and should be preserved. "Nearby is another interesting relic of the past - Stonnall Castle mounds. Many people have asked why there are no remains of stone, but they are wrong in their premise for it was not a stone-built castle but, in fact, a fort with a mound, moat and stockade. It is over 2,000 years old. "Long before the coming of the Romans, this district was inhabited by Cangi, a tribe of Celts or Ancient Britons as we call them. These were herdsmen who hunted for wild meat and lived in settlements all around the Cannock Chase of which this area used to be part. Similar forts were built on many parts of the Chase. "At times, these hill forts were a source of trouble to the Romans. In Saxon times, Ethelfleda daughter of King Alfred the Great refortified some of these old hill forts with wooden castles as a defence against the Danes. And so one could travel on through history. "All around Shire Oak Hill there is evidence of it having been inhabited in the remote past. There is the tumulus at Catshill, Brownhills and the wooden piles at Pipe Hill. Over 2,000 years ago there was a settlement at Vigo, Walsall Wood. "It is a pity that there has not been closer scientific investigation in this area. Present-day developments in housing and industry may destroy much historical evidence. I would urge that such steps should be taken to survey the whole area for what a story could be pieced together for our history books. "Further, I would urge that landowners should preserve anything to which a legend is attached, for it may be very important." What can be gathered from this letter? At first glance, the letter appears to be a goldmine of information. However, if we ignore as irrelevant the several suggestions, speculative statements and various assertions regarding general historical events, we are left with a few supposed facts: Grove Hill had been the tomb of an Iron Age Celtic warrior; that it had been excavated in 1824, with various objects having been found; that it had captivated schoolboys' minds for hundreds of years. The obvious problem here is that Mr Poxon does not state how he knew about any of these things. Moreover, as we will see, it is possible that he conflated and confused the suggested Grove Hill investigation with another local archaeological discovery that we know beyond any doubt to be a factual certainty. In 1824, the same year in which Grove Hill was supposedly excavated, the field's landowner was William Tennant, Esq, who was based at Little Aston Hall. He owned an enormous amount of land in the Parish of Shenstone, including many of its farms. One such property was Gainsborough Farm, less than a mile away from Grove Hill. While working near the Gainsborough farmhouse in the year in question, some labourers happened upon an ancient grave (now interpreted as a Bronze Age burial) and several items were recovered from it. The point here is that the range of these excavated materials was identical to that described by Mr Poxon as having been discovered at Grove Hill. Two archaeological discoveries in a single year? The same items found? Half a mile from each other? The same landowner? All these things are possible, but could this be just a bit too good to be true? Is it the case that Mr Poxon got things a bit mixed up? We will return to Mr Poxon's letter later. As to the fate of the items recovered at Gainsborough Farm, it seems that they were placed in the custody of the Tennant family, after which History lost track of them. An account of this discovery and the subsequent events and circumstances surrounding it can be viewed in this article. But could this explain the trench? As mentioned, the trench was horseshoe-shaped but, significantly, it was dug quite clearly around the present tree, presumably to avoid its root system. If the tree had been there at the time of a supposed 1824 excavation, it would now be over 200 years old and we now know that this cannot be the case. The hill and folklore research: was there really a tumulus? In the early 1970s, a student, Judith Higgs of Stonnall, conducted a research project on folklore in the Stonnall area as part of a university assignment. Naturally, one of the items of interest was Grove Hill and, in the course of her work, she received several responses on the subject. These stories included the supposed facts that it was the tomb of an Iron Age warrior who, when dug up, had been found wearing a suit of golden armour; and that the ghost of a Roman centurion haunted the place on midsummer nights. Perhaps the least sensational and possibly the most telling comment was collected from Mr Ikin, with whom we have already met, as it were, about 30 years previous to Judith's research. When asked why the solitary tree of Grove Hill had been left as it was, he is said to have replied that it would be bad luck to pull it out - and that had also been the attitude of his father. Here it appears that Mr Ikin invoked superstition, in the sense that if a certain action were to take place, a bad consequence would be the result. In this case in other words and by implication, interference with the tree and the hill would violate in some way an ancient attribute of these features. Furthermore, Mr Ikin is said to have reported that this attitude had been transmitted down two generations of his family. Are we to believe that this had started with his father, or was it possibly the direct consequence of a long-established folk-memory? The Ikins undoubtedly had contact with their immediate predecessors at Manor Farm, the Smiths, who undoubtedly had contact with their predecessors, the Wrights. There was, therefore, every opportunity for a folk-memory to be handed on, family to family, tenant to tenant, parent to child, over a long period of time. But, if it ever existed, just how deeply-seated was that folk-memory? Could it have been transmitted over numerous generations for hundreds or possibly even thousands of years? Returning to the Poxon letter, let us for a moment, then, give its writer the benefit of the doubt and remind ourselves of one of the things he said: "For hundreds of years, legends about it have always captivated the schoolboy's mind...". In 1680, a professor of chemistry at Oxford University, Dr Robert Plott, visited Stonnall to investigate the hill fort at Castle Hill. We know that he had at least one local informant, Mr Brown (who was in all likelihood one of the Brown family of Thornes Hall and Footherley Hall). If Dr Plott had been informed of an Iron Age tumulus at Grove Hill, we would most certainly have expected him to mention it in his account because it would have been additional confirmation of prehistoric activity in the Stonnall area. A detailed plan of the hill fort at Stonnall, from an early 20th century OS map. 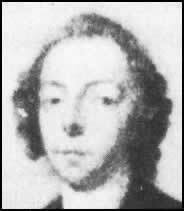 A couple of generations later in the mid-18th century, Reverend Henry Sanders was a curate in the Parish of Shenstone. As a parishioner for many years, he knew Stonnall intimately and his knowledge and experience of the village would eventually be recorded in his book The History and Antiquities of the Parish of Shenstone. In this book, he described in great detail all the local landmarks and any and all folklore associated with them. 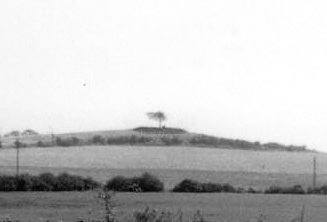 If he had known that Grove Hill was reputed to be a tumulus, he would most certainly have written as much in his book. Finally we come to Reverend Stebbing Shaw. His book, A Survey of Staffordshire, was published in about 1800. Although his coverage of Stonnall was less detailed than that of Rev Sanders, he covered all the local historical landmarks and we would therefore expect him to report a supposed Iron Age monument at Grove Hill. What did they say about Grove Hill? The fact is that, as far as Grove Hill is concerned, all three men are completely silent. As non-residents, Dr Plott and Rev Shaw could be forgiven for an act of omission in failing to give notice to Grove Hill, if there ever was anything to give notice about, that is. But the same could not be said of Rev Sanders. As one of the parish clergymen, clearly, he had travelled the roads and footpaths around the village. He had definitely visited nearby Thornes Hall in Church Road and, although we don't know it for a fact, probably on at least one occasion he had walked or ridden to the top of the hill to admire the views. He must have known Grove Hill. So why did he fail to mention it? There really can be only one reason. Since no-one had reported any stories associated with it, as far as he was concerned, Grove Hill was a good viewpoint but an otherwise unremarkable hill with a pleasant but otherwise unremarkable group of trees on top of it. In short, it simply was not notable enough to exercise his writing hand. Ditto Dr Plott and ditto Rev Shaw. From this we can conclude that there appears to have been no current local folklore pertaining to Grove Hill in quite a long period, extending from the late 1600s to the early 1800s. Moreover, if we are to consider folklore as valid in any way, that is to say, that it relates to actual events and cirumstances of the remote past, we would expect it to be reported continuously in an unbroken chain. Clearly, in this case and over an extended period of time, it was not. And therefore, unfortunately, we can conclude that Mr Poxon's claims were fanciful. For the same reason, we can conclude that any and all stories associated with the tree and the hill, such as those collected by Judith Higgs, are recent fabrications, or - to be blunt - groundless myths. In short, there is absolutely no evidence whatsoever, whether supported by folklore or physical material, that the tree marks the location of an Iron Age tumulus. Nevertheless, there must be an explanation for the single tree and the grassy knoll. This leads us to a reconstructed narrative of the story of Grove Hill, taking into account everything we have discussed and noted so far together with some additional items of information, which will solve its mystery once and for all. The story might have begun over 2,000 years ago when the hill fort at Castle Hill projected the power and prestige of an Iron Age tribe, the Cornavii. If ever there was an associated local hero deserving of a very special location for a final resting place, Grove Hill would certainly have been such a place. When farming commenced in the area, probably during the Iron Age, most of the hill's tree covering was removed and a grove was left behind, possibly in a superstitious response to a half-forgotten folk-memory of an ancient burial. Another possibility is that it was intended to be a location of ritual purposes and social contact. The proximity of the Iron Age hill fort and Druids Heath is supportive of that possibility. The grove was incapable of regeneration for whatever reason and it gradually died away over time. Over this period, all associated folklore, if ever there was any, appears to have been forgotten. The last representative of the grove disappeared in the late 19th century. Even before that event, the tree we recognise today and the now-lost surrounding grassy area appeared on the landscape (see fig 3). We have noted that three books written between the late 17th century and the early 19th century provide us with not even a single mention of the hill. However, fortunately we can turn to some very reliable sources in the form of the local press which, as a matter of fact, has been reporting incidents in the Stonnall area since the early 19th century. A contemporary report in a local newspaper stated that, after St Peter's Chapel of Ease had been completed and consecrated in 1823, the parishioners of Stonnall erected a tent on the 'nearby hill' in which to hold a celebration. 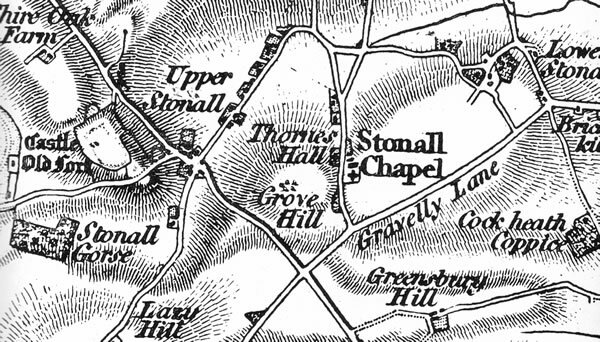 This may well be a reference to Grove Hill, as the report could not have been referring to the hill on which the chapel was built, which would have been the same hill and not the nearby hill. A report in the Wolverhampton Chronicle of Wednesday August 21, 1839, stated that, after an appeal to raise the funds for a new master's house and after these funds had been paid out, there had been a surplus of 84s (£4.20). This was used to throw a party for the children of the Sunday and National Schools of Shenstone and Stonnall on Thursday, 8 August. Once again, the parishioners erected a tent on the 'adjacent hill' in which to hold a celebration. These incidents yield clues relating to the practical significance of the hill, which seem to be confirmed by the next newspaper report. Friday, May 20th, was fixed upon by the friends of the Stonnall National and Sunday Schools for the treat annually given to the children. A hilly field near the school, called Grove Hill, admirably adapted for the purpose, was kindly lent by Mr. Wright. A plentiful supply of buns, cake, and tea was dealt out by Mrs. and the Misses Downes, and a number of ladies and gentlemen. Once again, as we noted above, following the consecration of the chapel of ease in 1823 and the children's party of 1839, we find that the hill was being used for a celebration, this time in the form of another schoolchildren's party. Bearing in mind that there was no public space in Stonnall until the late 1960s, it would appear that the hill was used habitually as a substitute for that resource. As we have noted above, that usage may well have extended from the remote past. But perhaps more importantly for the purpose of this investigation, we find that the landowner, Mr Wright, had admirably adapted the hill for the occasion, according to the last of the three newspaper reports. 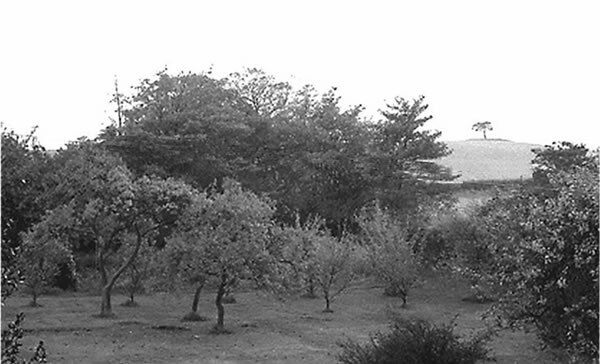 Grove Hill as seen from the west in the early 1960s. Although neither turf nor tree are mentioned explicitly, admirably adapted must mean, at the very least, the laying of turf for people to stand and sit on. That the tree was planted at the same time as the turf was laid would be a reasonable guess. Remember our mental picture of the old grove? A grassy island with trees on top of the hill. Mr Wright had created a bijou analogue, or replica in miniature, of the old grove that he had known all his life, but which had virtually disappeared during the course of his lifetime. 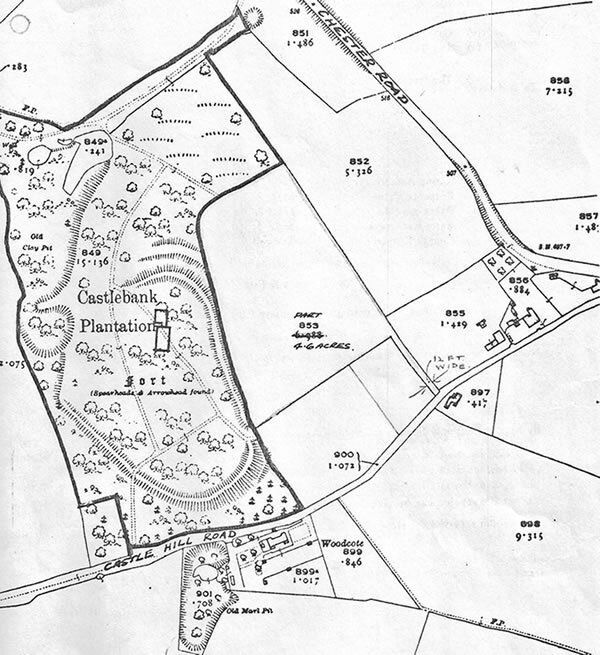 The Wright family is noted in the Tithe Map survey of the early 19th century as the tenant-occupiers of Manor Farm, Stonnall, which was owned at the time by William Leigh, William Tennant's successor as lord of the manor based at Little Aston Hall. 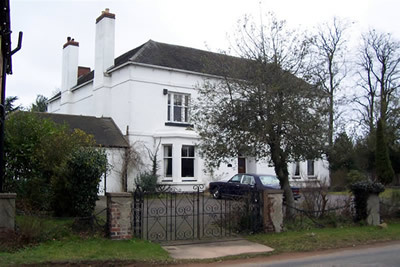 At some stage, the family acquired the freehold of the estate, probably following the death of Mr Leigh in 1840, after which parts of his estate were parcelled up and auctioned off at a Walsall hotel in the early 1840s. The family was prosperous and several live-in servants were noted in the census returns of the late 19th century and the early 20th century. There were at least three generations of Manor Farm-based male Wright family members who shared the given name George, the apparent first of whom was noted in the Tithe Map survey of 1838 and the last of whom passed away in 1926. In 1859, George the first, so to speak, would have been about 60 years of age and his son George the second was about 27. We conclude that one or other of them was responsible for the creation of the Grove Hill feature. The tree in winter with the hill fort in the background to the left. The white upper storey of the Manor House is visible slightly to the left of the base of the tree. Did superstition play a part? He did this ostensibly to help facilitate a children's picnic, but the question as to whether this was his only motive can be raised. We have noted Sam Ikin's somewhat superstitious response when he decided not to interfere with the tree because he considered that it might be 'bad luck' to do so. Did Mr Wright harbour similar feelings with regard to the ancient grove? After all, he had presided over a period during which it had all but disappeared. Was this new feature his way of righting a wrong, a way of warding off what he might have believed to be the ill-omened consequences of his failure to protect its ancient predecessor? Of course, identifying Mr Wright's precise motives is a virtually impossible task, but there is one related question that we can answer with certainty: was Mr Wright superstitious? In the late 1990s, the new owner of the Manor House, Barrie Swain, found it necessry to lift some floorboards to make some changes to the electrical wiring. In the cavity, he found that sawdust had been used as an insulation material. Rummaging around in that, he discovered an infant's, probably a girl's, leather shoe (see photo). It just so happens that Barrie is a saddler and therefore an expert on leather stitching among the many other aspects of his trade. When he examined the shoe, he found that the stitching was too fine to be considered the handiwork of a person using a needle and thread. Therefore, the work was done by someone using a machine. This places the date of the shoe's manufacture in the latter part of the 19th century, in other words, firmly in the period of occupation of the Wright family. 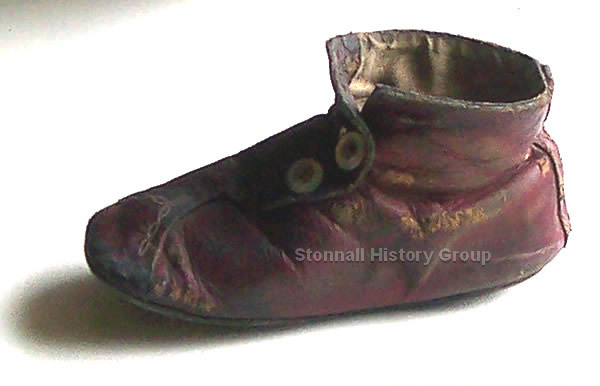 This discovery is an example of the Concealed Shoe custom and examples have been found in many parts of Great Britain, although according to Staffordshire County Council, to which the find has been registered, it is the only known example to have been found in the county to date. The custom is poorly understood, but there can be no doubt that persons who practiced it were motivated by superstition. It is inconceivable that this shoe was not concealed without Mr Wright's knowledge and consent. Therefore we can conclude, beyond reasonable doubt, that Mr Wright was a superstitious man. Did some aspect of that condition influence his thinking with regard to his Grove Hill feature? All we can say is that it may well have done. Furthermore, it is an intriguing thought that moments after admiring his handiwork from a window at his house, he acted to conceal the shoe. 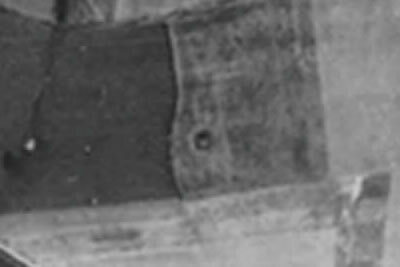 An aerial photo of Grove Hill dating from 1945 with, centre, the tree and grassy knoll. Whatever Mr Wright's motives may have been, in recognition of the fact that the hilltop had been a meeting place, probably for centuries, his new, turfed area would henceforth serve as a platform for subsequent visitors to stand or sit on and help to prevent wear and tear. The Manor House, Stonnall, formerly the Manor Farm farmhouse (and before that, the Swan Inn, but that is another story). George Wright was the occupant in the early to late 19th century and he would have been about 60 years old when he planted the Grove Hill tree. Perhaps a few years after the tree was planted, the upper part of its trunk was broken off, probably as a result of vandalism. Nevertheless, the tree survives to the present day, but with the damage still clearly visible during the winter months. The Grove Hill tree as seen from the Manor House front doorstep, Excluding the recent housing developments, this is the view that would have greeted George Wright on leaving his house every day. There can be no doubt that it was George Wright of Manor Farm who arranged for the tree to be planted on his land at Grove Hill directly in line with his house and in the centre of the turfed area that he created. Indeed, the tree is placed so precisely on the horizon relative to the Manor House that we can be absolutely certain that instructions for its exact placement were indicated from the house at the moment the tree was planted. Postscript 1: which came first, the tree or the turf? As noted, the tree was placed exactly and quite deliberately on the horizon relative to the Manor House. It was also at the centre of the turfed area. This means that the tree was planted before the turf was laid because otherwise the positioning of the turf would have been pure guesswork. Postscript 2: did Mr Wright have a wooden leg? In the 1950s, Mary Nicholls (the wife of noted Stonnall artist, Vic Nicholls) worked as a domestic at the North Manor House for the Maurice family. During the course of her work, she was informed by another domestic that, if she could hear a clomping noise on the stairs with no apparent cause, it was the ghost of George Wright walking with his wooden leg. Thanks to Mary's daughter, Mary Freer, for the anecdote. As noted above, the woodland that once covered the Stonnall area was essentially an extension of that of Cannock Chase and the grove was a remnant of it. The most common tree types on the Chase are pine, birch and beech and we can be reasonably certain that these were represented in the grove. The presence of one or more beech trees in the original grove may well have been in the back of Mr Wright's mind when he selected a tree of that type to plant on the hill top. 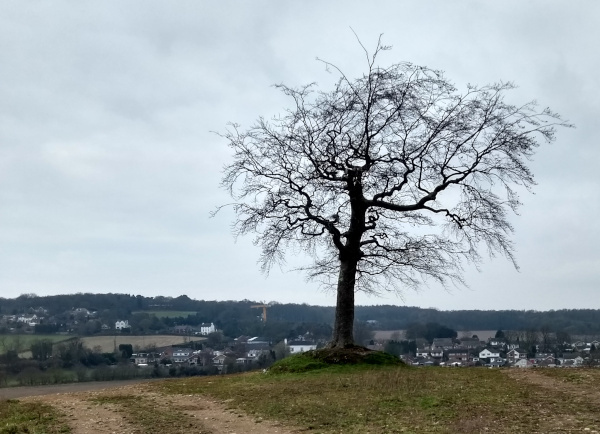 The Grove Hill tree as it was on 1 March, 2019. Postscript 4: 160 years old - really? As noted above, the tree lost the upper part of its trunk at some stage (see photo above). This means that with only 50% or less of the crown that it would have had, it would have grown only 50% or less of the leaves that it would have otherwise produced. It also lost some of its roots when the surrounding turfed area was removed about 40 years previous to the time of writing. These negative factors, together with its somewhat exposed location would inevitably have a negative effect on the tree's girth (the thickness of its trunk). The tree's circumference was measured on 1 March, 2019 and was found to be 190cm at about 1m above the ground. Taking into account the negative impact of the circumstances described above, we can make an educated guess that the circumference is only about 2/3 of what it would have been. In other words a circumference of about 275cm or perhaps even more would have been expected if the tree had been left to flourish in more natural circumstances. A beech tree circumference of 275cm indicates an age of about 160 years according to detailed observation. This can be verified by an online tree-age calculator. The number concurs with the documentary evidence collected, as noted above. Postscript 5: the broken trunk - whodunit? As we have noted, at some stage the tree's trunk was broken. Who or what was the culprit? We will never know for certain, but it seems that a weather event was the least likely cause. After all, trees have evolved to withstand bad weather. So if the cause was vandalism, who might have been responsible? Although there is no evidence against him, there was certainly someone around at the time who almost certainly held a grudge against Mr Wright because he had been prosecuted by him for poaching. If I had been a police officer at the time, the man with a motive for revenge would have been the first suspect to be taken into custody to help with enquiries. That man was none other than local bad boy and poacher Billy Broadhurst. © Julian Ward-Davies BA Hons 2015. Revised February and March 2019.